Kirtan is becoming a little less weird for me. It’s still strange enough that a) I don’t know that many people who practice it and b) I’m not inclined to attend an event that promises tons of it. But I caught myself singing one mantra in the shower, recently. A week ago at an all-weekend meditation teacher training course, I did some (vocal) mantra practice in a small group, assisted by a wonderful teacher and some recorded music. 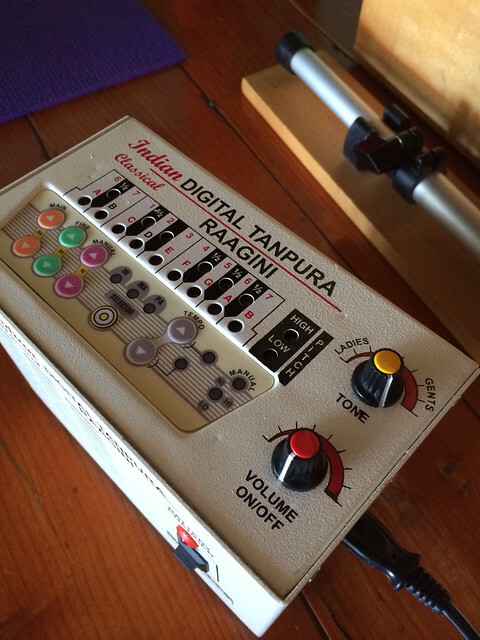 Note: pictured above is an instrument that assisted us in another meditation exercise: an electronic sitar machine! One track in particular, The Healing Drum’s Ganesha, caught my attention. It not only had wonderfully rhythmic, inspiring drum sounds in it, but also was the only mantra I know by heart. This one has stuck with me because it’s relatively simple, it evokes (and invokes) a Hindu deity I find charming, and I first heard and sang it a in a class taught by one of my favorite teachers, Nora Byrne. I bought the album and used this music for a run last week, when I was trying to get my stride rate above 160 steps per minute. It worked! The up-tempo RPM is the most likely culprit, but perhaps inspiration played a role as well. It’s possible that Ganesha helped remove the obstacle of my slow foot turnover, but for now I believe this: that rhythm really got me moving! So, we’ve got rhythm. Also effective for making something stick: a good story. I read the Ramayana (an abbreviated and stylish storybook version) last fall and learned about Rama and Sita. in the class this weekend, we did a simple chant, “Sita ram sita ram sita ram jai sita ram.” I liked the story, so it was enjoyable to sing about some of the characters. So. Mantras. They can move you. It’s worth looking into the nature of sound and its effect on the brain. Suggested reading from my meditation course included this book: The Yoga of Sound: Tapping the Hidden Power of Music and Chant. It’s next on my list. More info if you’re interested: the meditation teacher-training course I took was at Yoga Center of Minneapolis, and was taught by the terrific Tara Cindy Sherman. I had a few other takeaways from that experience that I may discuss in future posts. In a way, it forced some introspection and yielded some surprising insights. Weekends with this much meditation are often billed as “retreats,” but perhaps this should have been called an “advance”? That’s assuming this is progress. I’ve slacked off on my daily meditation session, so I have my doubts, and I’m a little hesitant to bring anything new to the classes I teach, at least in terms of meditation that isn’t the mindful movement of the physical asana practice. The strange spring of 2014 continues. Stay tuned. To my yoga students: I am still working on finding studio space. I miss you! Peace be with your practice.